McDonald’s is looking to hire over 300 student-crew/grantees in Cebu this year through Special Program for Employment of Students (SPES) in partnership with Department of Labor and Employment (DOLE), establishing its progress and success in the employment of underprivileged students and out of school youth in Cebu. SPES beneficiaries’ responsibilities are maintaining the cleanliness of restaurant areas, proper preparation of beverages and desserts, and providing assistance to local store marketing team during events or McCelebrations held at McDonald’s restaurants. Present during the press conference were representatives from the Department of Labor and Employment (DOLE) Jessica Uy and Atty. Jose B Ogang; McDonald’s Philippines Vice President for Human Capital Group Chona Torre and Public Employment Service Office (PESO) Fidel Magno. Each representative discussed the progress of SPES and its success rate in Cebu, key criteria for hiring and screening, and day-to-day training programs that SPES students undergo with McDonald’s. Special Program for Employment of Students (SPES) enables employment for the students in partner private sectors, where McDonald’s Philippines has offered over 3,600 slots for students to be crew members across the country. McDonald’s Philippines and DOLE made their partnership official in March 2012, following Republic Act Nos. 7323 and 9547’s call to encourage students to pursue their education through employment. Subsequent to these laws is RA 8759, creating the Public Employment Service Office (PESO) to facilitate employment of the beneficiaries, located in capital towns of provinces, key cities, and other strategic locations. This year, McDonald's hiring of Student Crews will be done in three batches starting March to December. 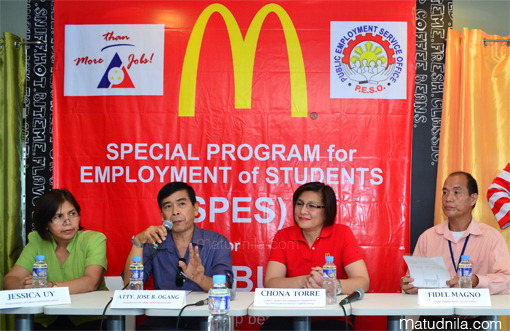 0 comments: on "McDonald's to hire over 300 Student Crew-Trainees in Cebu through SPES"